A four-year varsity punter in college, where he had an 81-yard punt in a game against Humboldt State as a junior, Barker failed to receive any NFL offers and played semi-pro football until being invited to Denver’s training camp in 1988 and Seattle’s in ’89, but was cut prior to the season in each instance. He finally caught on with the Chiefs in 1990 and spent four seasons with them, averaging 41.4 yards on 272 punts. 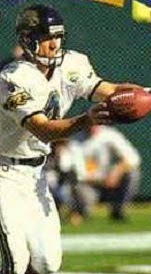 He spent one year with Philadelphia before joining the expansion Jaguars in 1995. Barker averaged 43.8 yards on 82 punts in ’95 and 43.7 yards on 69 kicks in 1996. While not known for having a strong leg, he was a good directional punter. Jaguars went 11-5 to finish second in the AFC Central and qualify for the postseason as a Wild Card entry. Lost AFC Wild Card playoff to Denver Broncos (42-17). Barker spent three more seasons with Jacksonville before moving on to Washington as a free agent, where he was reunited with Marty Schottenheimer, his head coach with the Chiefs, in 2001. Following three years with the Redskins, and with his skills in decline, he spent a season with Green Bay in 2004 and appeared in nine games with the Rams in ’05. After drawing no interest in 2006, Barker officially retired. Overall, over the course of 16 years, he played in 236 games and punted 1132 times for a 42.1 average. Only two were blocked, and none in his last 878 punts, a streak which ranks second all-time in the NFL. His 326 punts inside the 20 ranked third all-time at his retirement and included a record-tying 8 in one game against the Ravens in 1999. Barker’s greatest success was with the Jaguars, with a 43.5-yard average on 456 kicks and a career-long 83-yard punt, also in 1999.